Hotels in Nizhny Novgorod - Hotel "Meschera"
Hospitably throwing open its doors in August 2010, the hotel already boasts a warm guest reviews and regular customers. 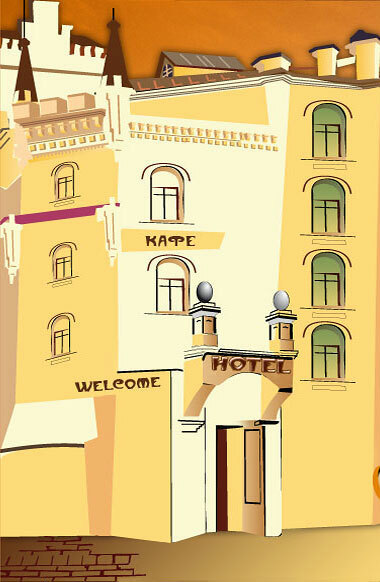 The hotel is situated on the banks of the Volga River, close to Nizhny Novgorod Fair, train and bus stations (3 km) and the historical part of the city (7 km). Convenient to transportation makes it easy to reach any part of the city. - The three floors of the hotel "Meschera" are 32 comfortable rooms to suit all tastes. - To organize a large group of tourists traveling? In the hotel's accommodation facilities "Meschera" for you two and three bed rooms. - Are you planning a business trip? Pleased to offer you a cozy single room. - The rooms have everything you need for a holiday. On the second floor housed a small cafe where you will find a delicious breakfast, during which you can learn all the latest news, which are broadcast on the big TV screen. Hotel "Meschera" offers a variety of dining options. The main feature of the hotel "Meschera" - democratic approach to pricing. The cost of a single room - from 1400 rubles. The cost of space, from 900 rubles. Of all the prices you can find in the price list. - Registration of foreign citizens. The main feature of the hotel "Meshchera" - democratic approach to pricing. Room rate - from 1400 rubles. The cost of space - from 900 rubles. We have provided three tariffs: basic, half and full board. You can always choose the right room for you. 2 - bed "Business" 3 persons "Economy"
Tariff "HALF BOARD - BED"
Copyright © 2009 - Hotel "Meschera"